CNTK provides a simple way to visualize the underlying computational graph of a model using Graphviz, an open-source graph visualization software. To illustrate a use case, let's first build a simple convolutional network using the CNTK Layers library. Now assuming we are training on the CIFAR-10 dataset, which consists of 32x32 images in 10 classes, we can assign the input shape correspondingly. Refer to the CNTK 201A tutorial for instructions on downloading and preparing the CIFAR-10 dataset for use in CNTK. To get the underlying description of the computational graph, CNTK provides a plot function in the cntk.logging.graph module. The plot(root, filename=None) function returns a network description of the graph starting at the root node provided. In addition, if filename is specified, the method outputs a DOT, PNG, PDF or SVG file (corresponding to the filename suffix). In order to output the DOT output, you will need to install pydot-ng (pip install pydot_ng). 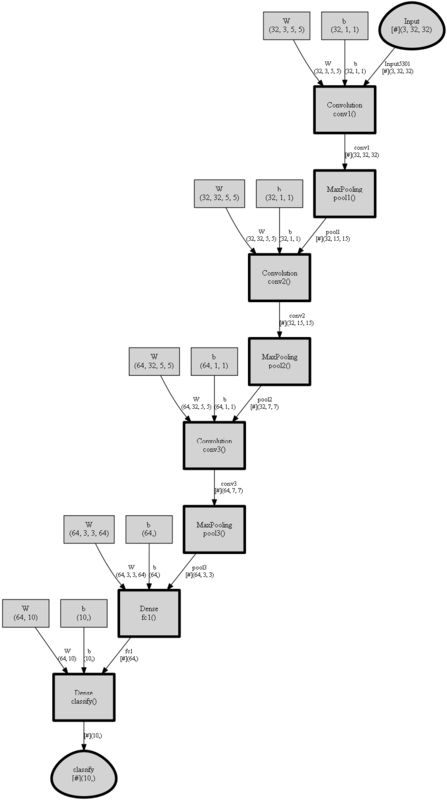 And if you would like PNG, PDF or SVG output, you will need Graphviz in addition to pydot-ng. Once you've installed Graphviz, ensure that the Graphviz binaries are in your PATH environment variable. For a more detailed example of visualization using logging.graph.plot, refer to the How to debug manual.